This picture of my parents Umedrai & Hansa, was photographed around 1963 in the village of Pravaranagar (Maharashtra) where they lived for a few years. They were married only a few months. 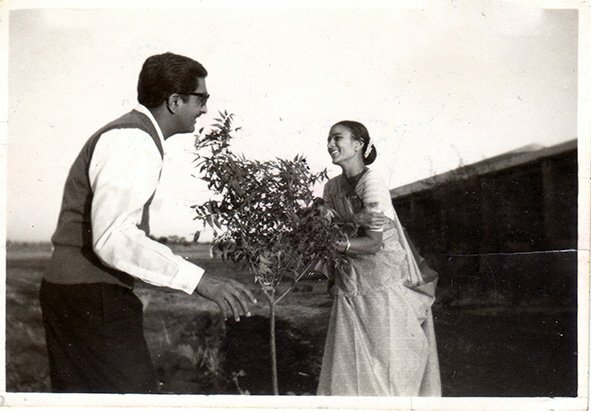 I’ve always wondered who took this picture, staged maybe after old Bollywood movie scenes of couples running around trees. My father Umedrai was born as one of nine children to Harjivan Bhaichand Mehta and Kamala (originally Triveni) in the small town of Ahmednagar, Maharashtra India. My father’s family belonged to a tiny community of Gujarati merchants in Ahmednagar and my mother Hansa was born in Nakuru, Kenya to Nagardas and Vimla Bhuva. Leaving Gujarat for Maharashtra as a young man, my paternal grandfather established ‘Harjivandas Bhaichand‘, a wholesale grocery store in Ahmednagar, that still provides for his great grand children more than a 100 years later. My maternal grandfather, on the other hand, had decided to make his way to Kenya as a young man and owned a textile & sewing shop called ‘Bhuva Store‘ in Nakuru with his brothers. The family travelled to and fro to India (Gujarat) often. My parents had an arranged marriage. At the time of the arrangement, my father was working as a merchant ship’s electrical engineer in Bombay with the Great Eastern Shipping Company. Right before the wedding, he quit his job which used to otherwise keep him away for a month at a time. My mother completed her Bachelor of Arts from Dharmendrasinhji College in Rajkot, Gujarat. A cousin introduced the families and they met only once before each side said ‘Yes’! I was born in neighbouring Shrirampur in the district of Ahmednagar. At that time, my father was an engineer at Pravaranagar Sugar Factory. Far away from her own family, my mother ran our home, made friends with the neighbours, walked to the temple, cooked, cleaned and embroidered. When my mother left on some visit, my father would cook his rice and dal in a pressure cooker before he left for work in the morning. Many trials awaited the couple in this picture in the future which they have decided to keep private. But here they seem carefree and happy and willing to be a bit silly. 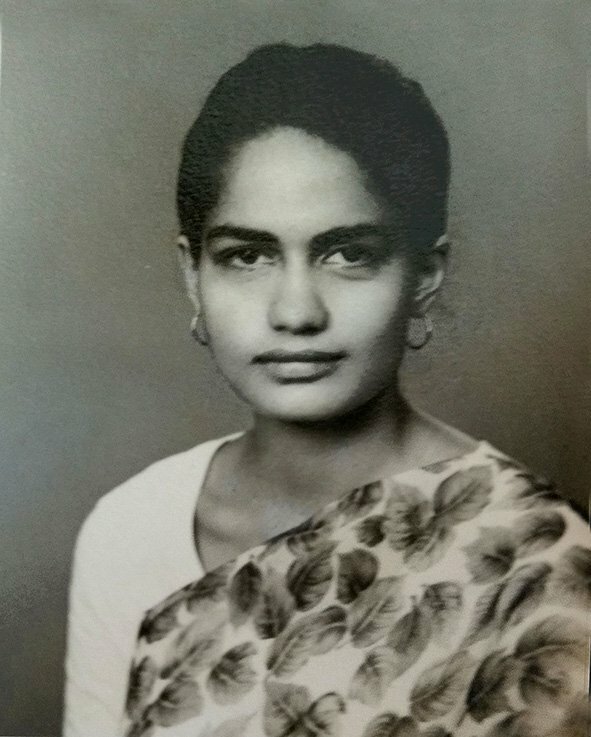 This is a photograph of my grandmother, Jaya Phatak. It was taken at a film studio in London in 1972. My grandmother was born in the Phatak family in Pune, Maharashtra in 1926. Her father Duttatre Phatak worked with the British Indian Railways, and was also the manager of a record label ‘Orion‘ that no longer exists. I am told he was instrumental in the first ever recording of Ustad Abdul Karim Khan, a well-known Hindustani Classical Singer and appointed musician to two royal courts in Baroda, and Mysore. Duttatre died when my grandmother was very young and over time her life turned out to be very different for many of the women of her era. She was very interested in sports and also represented the State at the Kabaddi Nationals in 1964. She was very young in 1942, when she became involved in India’s Independence movement in Pune. She was jailed along with other 6-7 of her mates and sent to Yerwada Jail for disrupting and distributing Anti-British leaflets at a British military gathering at Nowrosjee Wadia College grounds. At the jail, she discovered many more imprisoned freedom fighters across castes and classes. They were detained and went through a one-month trial, and offered either Bail or an arrest for a month in jail. The family didn’t have much money so there was no bail forthcoming. Despite an arrest for only a month, my grandmother says that they were still not released and instead were kept for another 11 months, because British law stated that it did not need to justify or give reasons to detain anyone. She notes that in prison, despite the fact that everyone was fighting for the same cause, a section of the higher caste would not share their meals with other castes. There was unsaid segregation along caste lines and at that time, castle lines were not questioned very much. My grandmother was married twice. 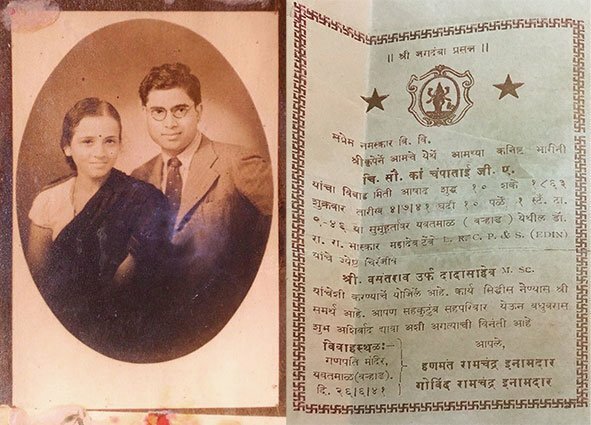 After divorcing her first husband which was unheard of at the time, she met and married my grandfather Vishwanath Modak, a journalist, who ran a daily political /social commentary column in the Marathi newspaper Prabhat and they fell in love. My grandfather used to call my grandmother “the man amongst the women”. She was fiery, opinionated and an atheist. My mother is the only child they had and jokes that her birth was an experiment that was never to repeated again. 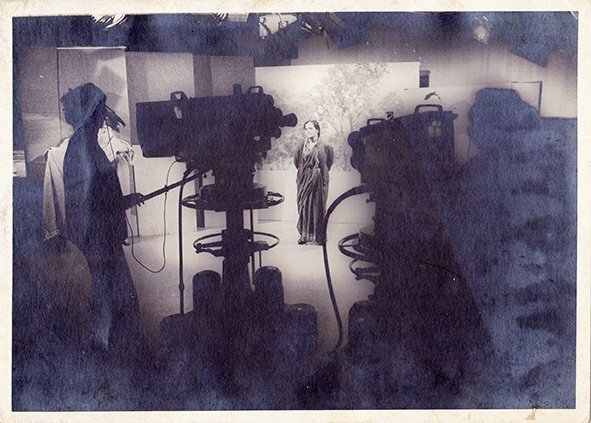 My grandmother Jaya found a good job at the Department of Education and was sent to England in 1972, to study and receive a Diploma in Production for Films – for education specifically. This picture is from that time when she was studying there. She also established a charitable trust called Kishor Mitra (“friend of the young”) where she produced short films on simple science – for instance how a Thermos or bread is made and helped publish Marathi books for making learning fun. Inspired by Sesame Street, the well known American Television series for children, she developed and produced puppet shows that were made into educational films. It was her first and last job until retirement. My grandmother Jaya continues to be a trustee of Kishor Mitra and lives in Pune with her granddaughter. Image and Text contributed by Jenny Mallin, Berkshire, England. “Rai, jeera, huldi..” she would whisper under her breath whilst counting the ingredients on her fingers. 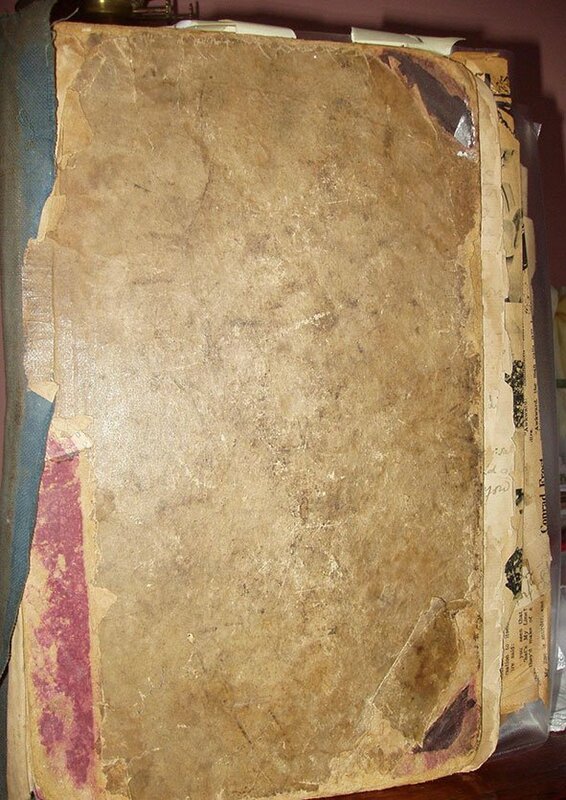 Cooking came naturally to my mother, but occasionally she would open the pantry door and out would come a huge ledger book (image link), whereupon she would leaf through the pages until she found the recipe she was looking for. With no title on the cover to distinguish it from the other cookbooks, the only distinctive thing I can recall is that each page was so delicate and fragile that it would snap like a popaddam (indian crisp made of gram flour) and therefore it was out of bounds for us children – this book was just too precious to lose. When I did manage to get my hands on the book officially, this most unglamorous book with its ochre, faded pages bespattered with sauces and flavours revealed several recipes handwritten in copperplate script by my great, great, great grandmother Wilhelmina dating back to 1850. Turning the pages one could see the handwriting style change over time, and evidence of how over five generations, each one of my grandmothers passed the book on to their next generation, offering us a chance to have a glimpse into a fascinating time in history, “the days of the Raj”, when the Indian subcontinent was under British rule. 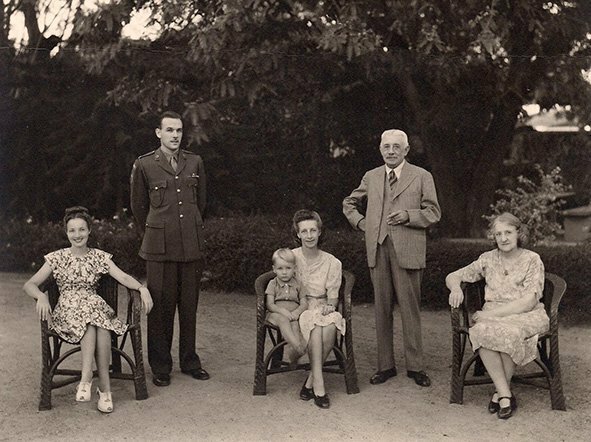 My family’s connection to India began six generations earlier in 1775, in Yorkshire, England. My great, great, great, great grandfather Benjamin Hardy, was born into a weaving family in Mirfield, a small but important industrial town with a population of 2000 people. The area was called the Heavy Woollen District of West Yorkshire. In 1794, Britain declared war on France and a 19-year-old Benjamin Hardy enrolled as Private No. 77 with the newly formed 1st Battalion of the 84th Foot regiment of the British Army. One year later, Benjamin married Frances Sheard in Mirfield and he and his regiment dutifully sailed to the Cape of Good Hope (South Africa). Sailing to the Indian coastline in 1798, Benjamin and his regiment would stay on in India for the next 25 years with postings in Madras, Bombay, Goa, Kathiawar, and Kutch. There were also detachments sent to the Island of Perim in the Red Sea, Aden and Mauritius where they participated in the capture of the island from the French. Benjamin’s last posting was to be in Bangalore. His regiment had been stationed there for four years and it seems that he also decided to bring his wife Frances over from England, for in 1816 she bore him a son Joseph (my great, great, great grandfather in the image above). 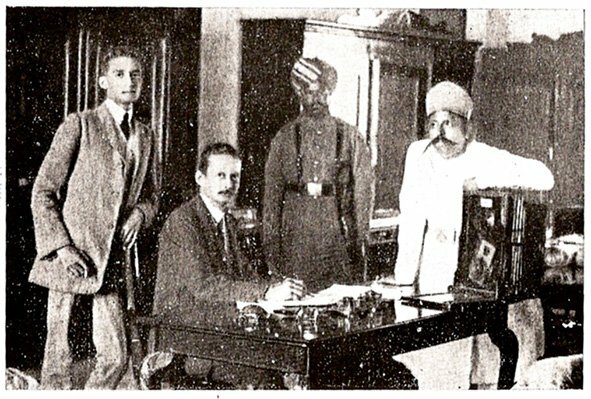 Three years later, Benjamin’s regiment was disbanded and asked to return home to England, but instead Benjamin chose to stay in India and was discharged from the British Army due to ill health. He was only 44 years old and suffering chronic rheumatism. Benjamin, his wife Frances and young son Joseph, settled down to live the rest of their lives out in India. However, Benjamin passed away four years later, on December 23, 1823 and Frances and her son Joseph continued to live in Bangalore. Joseph became a schoolmaster by profession in Mysore, in 1833, when an English School was opened for the first time in Mysore. At the age of 28, Joseph married Wilhelmina Sausman, in St. Mark’s Church in Bangalore. Wilhelmina was only sixteen when she got married. She was born in Vellore, Madras on September 12, 1829 and records suggest that she was Anglo-Portuguese because her mother’s name was Louisa Dias, a common Portuguese name used in the Portuguese colonies of Goa and the west coast of India. This photograph of my great, great, great, grandparents, schoolmaster Joseph and his wife Wilhelmina was taken in the early 1860s (in their mid 30s/early 40s) by studio photographers Orr & Barton, who were based in South Parade, Bangalore. 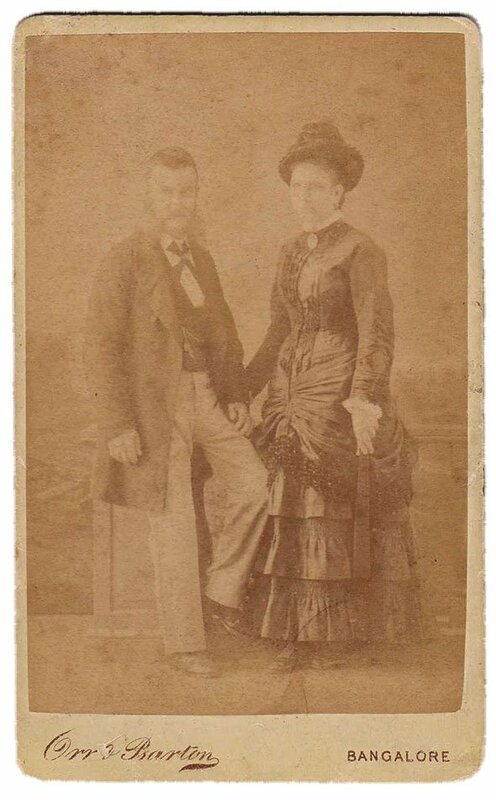 It is the oldest photograph in our family collection. During their marriage, Wilhelmina gave birth to eight children, but as often was the case those days, only three survived. The others were lost as babies and infants to the widespread pandemic of cholera that had killed around 15 million people by the 1860s. Their three surviving daughters were named Ophelia, Florence and Topsy. Ophelia, their eldest child was born in 1855 and is my great, great grandmother. Wilhelmina’s notes and my own research suggests that for any memsahib settling in India was an overwhelming, even exciting experience but also thwarted with difficulties. Aside from the unrelenting heat, the major problem was in the hiring of servants, and in finding a cook who would be willing to touch the different meats that wouldn’t conflict with their religious beliefs. A Muslim servant for instance, would not touch pork, nor serve wine, or remove dirty plates from the table or wash them. Hiring a Hindu was also not easy, as they would not handle beef, fish, poultry, eggs or alcohol and the very strict practitioners would also refrain from onions and garlic. It’s quite possible that Wilhelmina, like hundreds of other European wives and brides followed Mrs. Isabella Beeton ‘s bestselling victorian guide, the Mrs Beeton’s Book of Household Management, as well as another publication that gave detailed instructions to European women on effective household management in India. She must have felt it good sense to write all her recipes in one book which could then be given to the cook to follow and perhaps even improve upon. Her Christmas cake recipe shown here, is also annotated by my grandmothers and cooks after. Generations after, this ‘more than 150 year old’ recipe book now lies with me, and I ponder over it ever so often with great personal as well as academic interest. 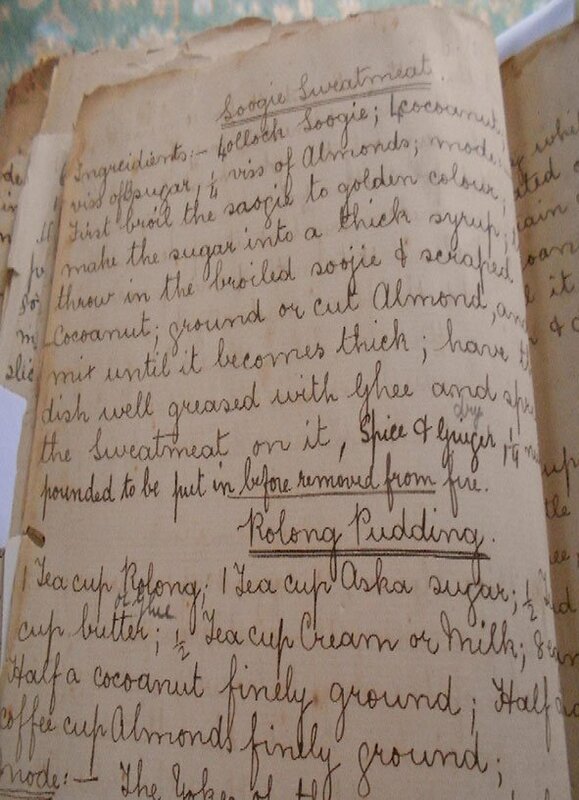 The contributor of this image and narrative is researching Anglo-Indian recipe names & cooking terms, and would appreciate any leads on the subject. She is also due to publish a book on Wilhelmina “A Grandmother’s Legacy – a memoir of five generations who lived through the days of the Raj”. This photograph of our family was taken by my youngest kaka (uncle) Shapoor at Juhu Beach. 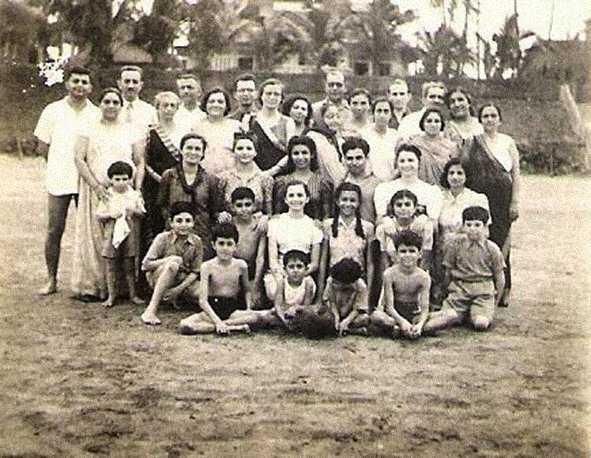 We had all gone out to Juhu beach for a picnic, outside the Palm Grove hotel (now Ramada Plaza Palm Grove). It was a regular haunt for picnics and we used to look forward to our day out for weeks. The beach was totally un-spoilt and had only a few small shacks around. Now I wouldn’t go even if someone paid me for it. I remember, we would take the train from Grant Road to Santa Cruz and then take a bus to Juhu beach. At that time the Bombay trains were not called Western or Central railways. The Western line was called BB & CI – Bombay Baroda and Central India Railways and the Central line was called GIP – Great Indian Peninsula Railway. I don’t remember what we would do though, I think mainly chatter, run around, eat and some of us swam. Picnic lunches were fun, sometimes they were large tiffins full of Pork Vindaloo. It was very tasty. In the middle wearing a white dress is Freny, now my beautiful wife, and on her left is me. Freny and I are also first cousins, our fathers were real brothers. Like some other communities in India, in Parsis too, marriage between cousins is allowed. Though we weren’t an arranged match, we just fell in love with each other. She was beautiful. I think even at this picnic I was eyeing her. Our parents must have noticed and declared that we must be made into a match. There was no ‘dating’ at the time, so the way I would get to meet her was – when she would be attending the girl guides meeting, I would go and fetch her back. We would walk through Azad Maidan and at Churchgate take the train to Grant road. At the time she used to live at Sleater Road. A lot of boys were after her, she was a beautiful girl you know, but I got her. At that time there was not much entertainment for us in Bombay. In school, we were big on Hollywood movies. It was our only past time. On Thursdays and Sundays, we’d be standing in the queue at the Metro Cinema (now Metro Big Cinema) and buy tickets for Four Annas (one Anna was 1/16 of a Rupee). In this picture, I would have been 11 years old and Freny was six months older to me. I studied at St. Xavier’s School and then St. Xavier’s college. My daddy was a foreign currency exchange broker, and would earn around Rs. 3000 a month, which was a lot of money and would take care of the entire family. After I left college, I joined the same business in 1951. At that time we didn’t question the expectations of our parents and teachers. My father was a tough disciplinarian but that was the general case with our parents anyway. My mom however, was full of mischief, and was a very jovial and fun person. Daddy used to pay me Rs.100 and when Freny and I got married my salary was Rs. 400. It was a lot of money for us. We used to go to the movies, for the office dances, and then there was Ideal restaurant where Freny and I would eat Chicken salad for 12 Annas. In the picture there were also my cousins from Canton, Hong Kong – Veera, Perin and Baji. My uncle and aunt were visiting India to show their children what India was like. But then Japan declared occupation in Hong Kong and they couldn’t go back. 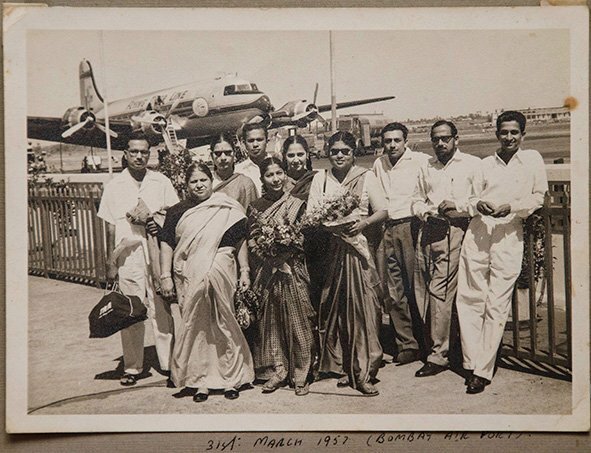 So they stayed here in Bombay for four years, until they could return. Veera was a beautiful girl. She was dark with one of the most beautiful faces one had seen. She was a great athlete, swimmer and diver -and all the boys used to run after her. My mom and she used to get along like a house on fire. They loved each other, and were in touch all the time. The ladies of my mum’s generation would correspond with each other in Gujarati and the men would write each other in English. Maybe it was because many of the orthodox families didn’t educate the girls for too long. When Freny’s elder sister was studying at Sophia’s college, one of the Parsi girls converted to Christianity. Right then my grandmother wrote to my uncle/father-in-law saying “immediately remove her from school”. Her fears were that maybe they will brainwash her into becoming a Christian. 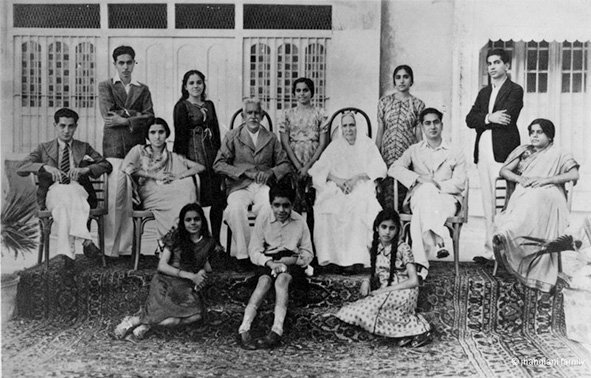 On the top right are Jehangir Tarapore and his wife Khorshed. 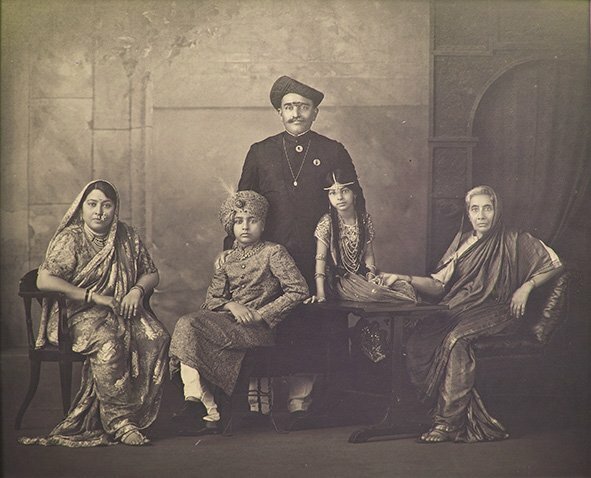 Jehangir was a very well known studio photographer in the Gujarati and Parsi community. His images are simply beautiful, very radical for the time. The superb quality of his prints still baffles me. Many of his photographs are now stored by a museum in London, with my daughter Sooni as the guardian. Sorab Kaka is on the top left. He was a professor of French and he used to teach French at the Elphinstone college. Shapoor, my youngest uncle who took this picture, was very fond of photography. As children we started off with cameras such as the Brownie and Agfa. It had only six exposures. Then they increased it to eight and we were ultra excited about that. I remember we had an old gramophone too, and had to change the needle after each record revolution. Then they started making bronze needles, each lasted three records, then came the gold needle which lasted eight records. We had to change it else it would spoil the record. Can you imagine that? This area where we live, the Gowalia tank was so beautiful at the time, it was an absolutely quiet locality. The trams used to end at the maidan (playground), and the only sound at night was the bell announcing the tram changing tracks. In 1942, the Quit India Movement Speech was issued by Gandhi right here at the maidan. I remember, I was at my boy scouts meeting and there was a rally going on. Then my father fetched me, because there was a lot of rioting and shooting going on and many people were killed. After Indo/Pak partition Bombay changed. I remember that in December of 1942, Japan dropped a few bombs on Calcutta, and so all the Gujarati traders fearing that Bombay will be next, fled back to their native places. Several apartments were available with “To be let” signs. Or as my Gujarati colleague used to pronounce it- “Toblet”. By the late 1940s, a lot of people immigrated into Bombay from Karachi and different places – the prices started rising, houses became difficult to get, and what really changed for the worse that suddenly the builders had the bright idea of ‘ownership apartments’. Till then all Bombay flats were only on rent and we didn’t have any ownership. Of course, a lot of the Parsis were pro-brits. You will find many of them still keep pictures of Queen Victoria and Queen Elizabeth and call them “Aapnee Rani” (Our queen). When Sooni did her photo book on the Parsis, I ensured that we get the book to the Queen in England. At first it got rejected, because of the letter bombs going around, then a British colleague helped me re-send the book to her. I have had a wonderful life with a very warm close knit family of cousins & friends and now grandchildren. Together we have had a lot of fun. There was always some outdoor activity or the other – trekking to Nepal or scooter tours to the south of India- the sites of our subcontinent are amazing. But Bombay, I tell you, was the most beautiful and interesting city. Indian textiles were a major part of the East India Company’s trade since the 17th century. Hundreds of thousands of people in India were involved in the textile trade, as spinners, weavers and dyers. By the early years of the 20th century too, textile and textile technology was controlled and promoted by the British and colonial masters. Indian textiles was a rapidly growing industry, especially since the demand for British cotton had slumped during the interwar period. During the booming era of the East India Company, raw materials were sent back to Britain and the finished goods were re-exported and sold in the colonies at exorbitant prices. The production and consumptions of textiles was controlled with imbalanced equations between the producer and the consumer, the coloniser and the colonised. When Mahatma Gandhi’s activism to promote khadi (homespun thread and home-woven cloth) became a big part of resistance to imperial authority, cotton became an important symbol in Indian independence and the Swadeshi movement began to overrule all. The resistance took the form of boycotting foreign goods and textiles. My father, Nirmal Chandra Ghosh (1911-1989), after his initial education in the Zilla School (district scool) in Hazaribagh, Jharkhand, (formerly part of Bihar), won a scholarship and decided to train as a textile technologist. In 1930, he became a student of Victoria Jubilee Technical Institute (now Veermata Jeejabai Technical Institute/VJTI) in Matunga, Bombay (now Mumbai). He graduated in 1934 becoming that year’s recipient of the Dadabhai Nowrojee Gold Medal. His name appears on the Roll of Honour, a board that is maintained in the Institute. Those were heady days of the nationalist movement and my father was very far away from home living in a cosmopolitan city thriving with conversations on the movement. At the time, for such distances from Bombay to Jharkhand, a railway journey would take more than three days, letters reached after more than a week and telephone calls were unheard of. 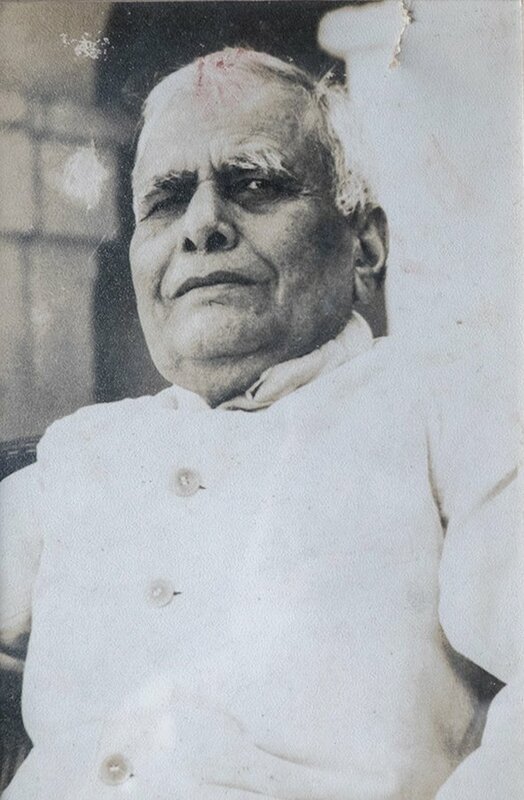 My grand father Kshitish Chandra Ghosh, was employed as a Post Master in the Bihar Postal Service run by the State & British administrators. It was a transferable job and he had warned his children, a large family of four sons and five daughters, that any nationalist activity they indulged in could be interpreted as anti-government and lead to losing his job. He sternly indicated that any anti-government activity would have disastrous consequences for the family as he was then the sole earning member and hence they would have to be very cautious. But my father, at the time a young man in Bombay, was inspired by the movement of resistance and found a way to express himself. In his final year (1933-34) one of the assignments that he had, was to design and weave a piece of cloth. 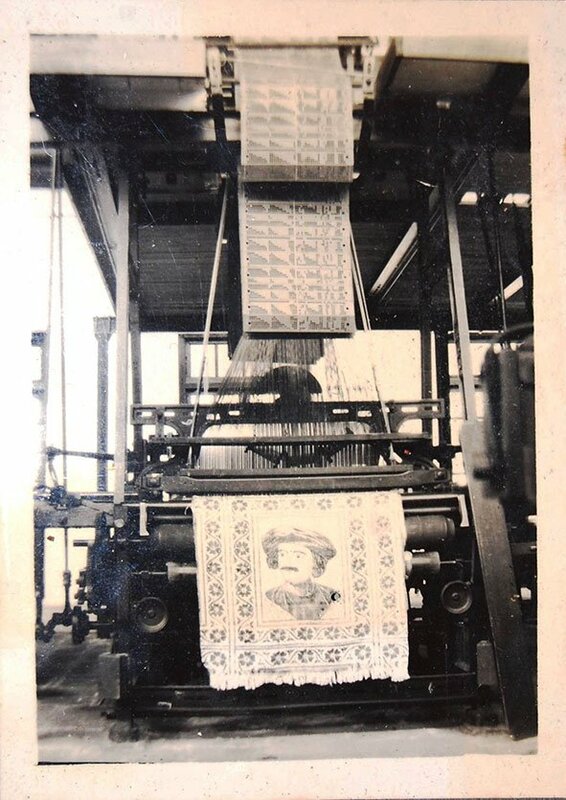 Very ingeniously he wove several textile portraits of public and national figures, highly respected and feted by patriotic countrymen. He wove portraits of Raja Ram Mohan Roy, the Father of the Bengal Renaissance, of Rabindranath Tagore, Poet & Nobel prize winner and of Mahatma Gandhi, already an icon of Indian nationalism. One of those portraits woven of Raja Ram Mohan Roy by my father, as shown in the photograph, was framed many years later and still hangs in my sister’s Kolkata home. As a child, I remember the woven portrait of Gandhi hanging in my grandmother’s room in Hazaribagh. The other portraits may have been gifted by him to others and seem to be lost. Luckily, this gesture expressing solidarity with the national movement went unrecorded and unnoticed by his sahib instructors. My father spoke of the act as an inspired passive resistance, and that it was a source of immense thrill and excitement when he was planning and executing the design. In volatile colonial times, it must have needed immense personal courage and extreme conviction to think and act in this manner. My father was also an excellent amateur photographer. The image above was photographed and pasted by him in his album. The album also holds photographs from early to late 1930s from the time of his education in Bombay to when he lived in South India on his first and only job with A &F Harvey Limited, established in 1883 by two Scottish entrepreneurs. A & F Harvey Ltd., a british company, was incorporated as a private limited company in 1945 to manage textile and other companies in South India. It acted as the Management Agents of Madura Mills Co., Ltd., until December 1969. My father retired from his job in 1970. When the overnight displaced family reached Delhi in India, homeless and with only few valuables on them, my grandfather took stock of what everyone had managed to carry across the border. Upon seeing what my father had carried, in those moments of life threatening crisis, my grandfather was livid. Angrily he asked my father – ‘Why did you not carry valuables!? What useless things have you carried with you? How can we survive without our valuables? You should have carried some valuables!’ My father had carried what he had thought were valuables, a few family photographs; and particularly those of his mother. The photograph above is one from the few my father had managed to save. This framed photograph found a place of immense pride on our home walls, in every house we shifted to and however big and fancy the houses got over the years with my father’s growing success. At the time my father’s family fled, he had been serving the Royal Indian Navy for nearly three years, since the age of 14, as rank ‘Boy 1’ and he was registered as Anand Prakash. He served on board the ships H.M.I.S. Dilawar and H.M.I.S. Bahadur until 1946 and was dismissed from the Royal Indian Navy because of his participation in the revolt that took place at Karachi port against the British Empire. 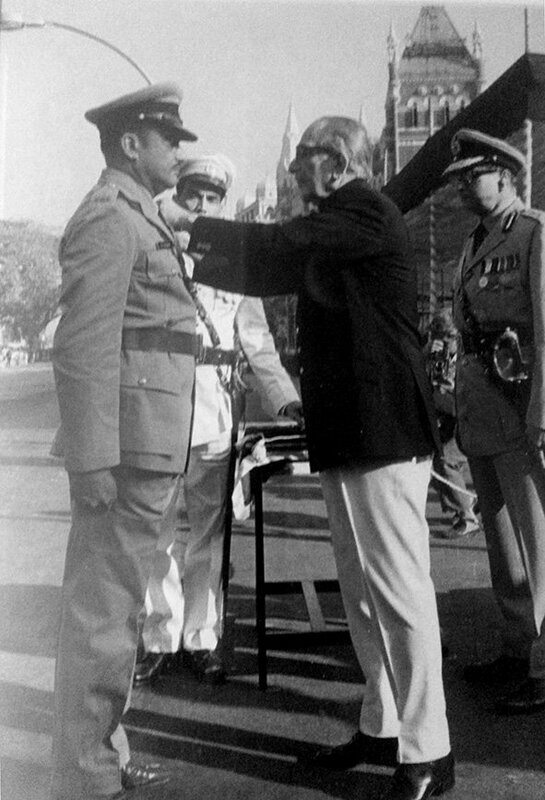 Post India and Pakistan partition, he joined the Indian army Corps of Signals, rank ‘Signal Man’, at Jubbulpore (now Jabalpur) and served for nearly six years. On March 25, 1950 a poem of his was published in the Army publication ‘Sainik Samachar’. A published poem gave him the confidence to try his luck as a lyrics writer in Hindi films. After he qualified as a Switch Board Operator Class II, he resigned from the Army in April 1950, and traveled to Bombay in quest of his dreams. But with no breaks or opportunities forthcoming, he ran out of money. He returned to the army and enlisted with the E.M.E. – (The Corps of Electrical and Mechanical Engineers), in February 1951, with the rank of “Ex-Boy”, and this time he registered as Anand Prakash Bakhshi. He qualified as “Electrician Class III” based at Jubbulpore and Lucknow, Uttar Pradesh. In 1954, he got married to my mother, Kamla. But yet again, after serving a total of seven years in the army, he took a voluntary discharge in 1956 and returned to Bombay, this time armed with 60 poems to find work. He also qualified himself as a motor vehicle driver as his ‘Plan B’ in case he didn’t succeed in finding a job as a song writer; he could always drive a taxi or work as a motor mechanic. History repeated itself, and within a few months in 1956, he ran out of money again and lost hope of ever making it as a song writer and despite the Plan B, he instead decided to return to his army job. While sitting at the platform of Marine Lines station to take the train back home, a ticket inspector named Chitramal Swaroop caught my father without a valid ticket and asked him to pay a fine. My father had no money. Chitramal then asked him if he had eaten, bought him some food and asked him what he is doing in Bombay. My father told him of all that had happened and that he had lost all hope of becoming a lyrics writer and had decided to return to his army job, and his wife. A patient Chitramal then asked Anand to narrate a few of his poems. After hearing his works, an impressed Chitramal picked up my father’s tin suitcase and told him to follow him home. He led him to his Western Railway Quarters at Borivali, and allowed him to live there a few weeks until he found work. With only a few poems that he had heard, Chitramal had come to believe, and rightly so, that my father Anand was an exceptionally talented man. Weeks became years and my father lived at Chitramal’s house at Borivali for nearly three years. Chitramal would even give him a pocket money of Rs. Two to eat and travel daily to meet producers and directors for work. I believe, my father Anand had two mothers, one who gave him birth, Sumitra Bali, and the other was Chitramal Swaroop; had he not stopped Anand Bakshi that day at Marine Lines station from returning to the army, the world of hindi cinema may never have discovered his poetry and lyrics. By the end of 1956 he got his first break in a hindi film by Bhagwan Dada, a well known actor and film director. 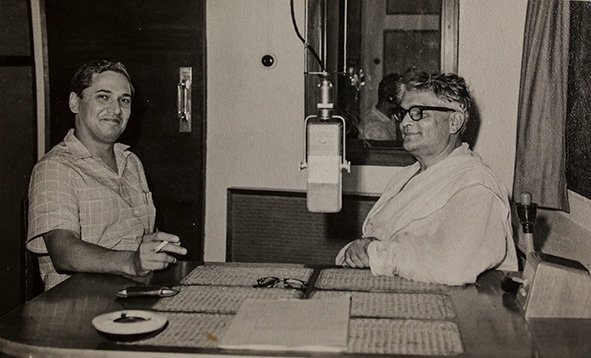 My father while sitting outside his office, overheard that a lyricist had not turned up, causing much stress to Dada. So my father walk into his office and told him he was a song writer, and he was immediately put on the job. But my father only got established by 1964, when the film Jab Jab Phool Khile became a huge hit. The songs were hugely popular across demographics and across the nation. After that, he found another big success with Milan in 1967; post that, he never lacked work until he lived. He wrote for the top most film producers and directors, several times for two generations of actors, producers and directors, until he passed away on March 30, 2002. He had by then written nearly 3300 Hindi song lyrics, for nearly 630 films. Some of his top songs, like the exceptionally famous “Dum Maro Dum” found cult status, and have been remixed and sampled by many other contemporary artists. The contributor is now writing a biography about his father. This picture was taken at my grandfather’s home, on the occasion of my aunt Zainab’s pre wedding ceremony. She was about to be married to a fireworks merchant. Zehra, was my mother Rubab and Zenab’s half sister. My maternal grandfather Abdul Husain Motiwala, a Pearl Merchant, belonged to the Bohra Shia Community in Saurashtra (now Gujarat State). At the time, during the early 20th century, Saurasthra’s coast line had been a rich hub for pearl hunting, and trade was in the community’s blood. The word Bohra itself comes from the Gujarati word vehru (“trade”). As most merchants and families began to adopt and attach last names after the products they traded in, my grandfather’s name Motiwala too, literally translates as “Pearl Man”. As a teenager, he decided to go to Bombay with Rs. 5 in hand, and landed up at the shop that dealt with pearls, for a job. Soon he grew in stature and bought the same establishment that he worked for. He turned the business around, made it hugely profitable and became one of the top businessmen of the community. 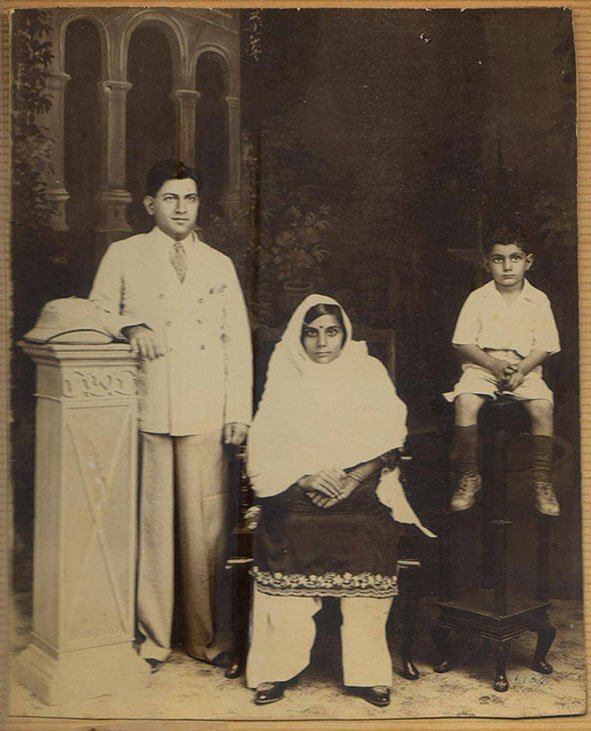 My grandfather Abdul Husain and Fatema, my grandmother, had three children together. With three daughters and two sons, it became a family of seven. Zehra and Zainab for some reason never got educated, while my mother and her brother studied up to 10th grade college. All the sisters got along very well. 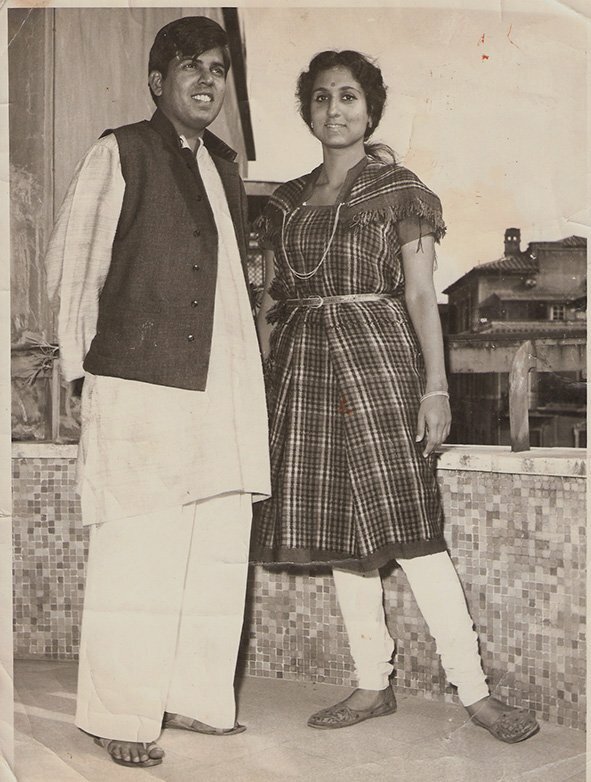 Two of whom were so close, that later while my father could afford a bigger house in Bombay, my mother insisted instead that we live next to my aunt Zenab’s house in a chawl (inexpensive community housing) near Bombay Central. While Abdul Husain was one of the best businessmen around, he was keenly aware of his own hardworking background. He had great respect for the dignity of labour and had no sense of class discrimination. He, for instance did not go easy on his own son Kamruddin, and ensured that he worked very hard to earn his keep. Another instance was, when a proposal for Zehra came from a man in the community who had walked away from his own family business. With problems at home, he had decided to begin life on his own terms and became a taxi driver. My grandfather agreed to the proposal, perhaps because he knew his to be son-in-law to be a dignified & hardworking man. He helped him out with good advise and offered him loans to build a fleet of taxis in Bombay. The advise was taken but the money wasn’t, proving my grandfather right. My mother Rubab or as she was fondly called Ruby, was the youngest and the most adored. So much so, that she like many of the youngest members in families enjoyed several liberties. Being exceptionally intrigued with photography, she would dress up in different attires & accessories and get herself photographed regularly by a photographer called Ahmed Zardi in the near-by photo studio called Dayzars. My father Ahmed, a photographer, and my mother Ruby, the photographed, fell in love over pictures, and my grandfather accepted the relationship with great ease. My father became a regular visitor at my mother’s home and would take our family pictures ever so often, even before they got married. It was the first love marriage in our family. Dayzars was a Photography studio in Bombay Central and was named after its two partners – Dayabhai from Rajasthan and my father Ahmed Zardi. They worked together for 32 years. As far as I know, it was uncommon for a Hindu and a Muslim to have such a great and long partnership. But when Dayabhai’s eyes began to fail him, he decided to leave Bombay and return home. My father and Dayabhai’s son tried to work together but a generational gap of ideas led him to relieve himself of the business and Studio Dayzars was sold. I was an only child and would frequent my father’s studio. I learnt how to handle cameras, developed film and made prints. The magic of the dark room was an incredible experience. However, I was absolutely not interested in studio photography and so I studied journalism and became an editorial photographer. In this photograph Purushottam Venkatrao Kadle, (standing rightmost) fondly called Vasant is my grandfather. He was 17 years old at the time. The photograph was taken, in honour of his elder brother, Lieut. Laxman Kandle, (sitting, in uniform) who was leaving for his duty as a medical officer in the military. He had been posted in Bengal for famine relief. The Bengal famine of 1943 had struck the Bengal province of pre-partition British India during World War II following the Japanese occupation of Burma. A mystery surrounds my grand-uncle Laxman. He never returned from Bengal, they tell me. A telegram arrived, with its customary terseness, which said he had died; cause and place of death, unknown. His body was never found. And a few days later, they got a letter from him, written when he had been alive. A pre-teen under the heady influence of a great English teacher, I fantasized about a novel I would write about him when I would grow up. That was back in 2005. The first letter offers more than mere curiosity of any Indian seeking out people from his own community when in strange land. The Kadles, the Koppikars, the Manjeshwars and the Kulkarnys are families from the relatively small Konkani-speaking community of Chitrapur Saraswat Brahmins, rooted mainly in parts of Maharashtra and Karnataka. Laxman tells his father about the fellow Chitrapur Sarasawats he met in Calcutta (now Kolkata), Bengal (now West Bengal). One notable thing was his concern for the women of his family – he asks after his ill mother, his dear sisters and even his young niece Jayashree, but doesn’t mention his brothers, or his nephews. Nevertheless, it was the second letter I found particularly moving. In the second letter, he describes his memorable journey along the River Padma (now in Bangladesh), that was something he would never forget. He describes the painful plight of the victims of the 1943 Bengal famine. He seems genuinely moved. And yet, through it all, there pervades a sense of purpose ; His will to serve and to be of use. He wrote about the arrangements he had made regarding money for the family, words sounding almost ominously like words from a will & testament. But the fact that the second letter reached the hands of his father after the telegram with news of Laxman’s death is what makes it almost like a Greek tragedy. I imagine my great-grandfather holding the letter, reading the words of his dead son whose body was never found describing his joys, worries and plans; and my 17 year old grandfather, Vasant, standing beside him, an awkward teenager. With a chronically ill mother and a shocked father, the death of an elder brother might not have seemed mysterious and romantic to him, as it does to me. And yet, it was he – of all the others – who kept these letters, safeguarded, for all these years. My grandfather couldn’t have been very different from me. 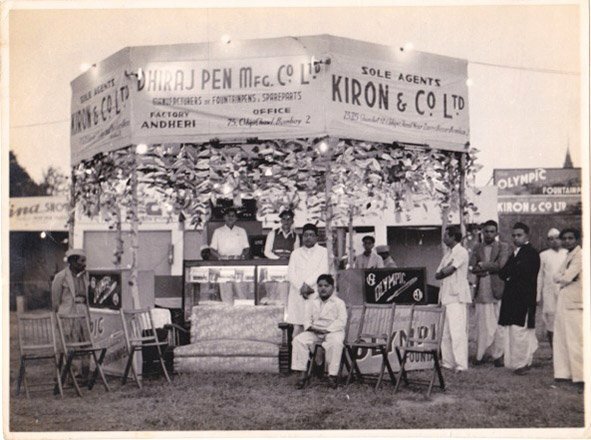 This picture is of my grandfather Dwarkadas Jivanlal Sanghvi and his brother Vallabhdas Jivanlal Sanghvi with their business partners at a Pen Exhibition in Bombay around 1951. My paternal grandfather Dwarkadas Jivanlal Sanghvi was born in Rajula, in Gujarat on September 17, 1913 into an impoverished family. He was around the age of eight when his father died and because his mother Amrutben could not afford to bring him up, he was sent to a Balashram (Children’s home). He only managed to study up until 4th standard. At the age of 13 he went to Rangoon, Burma to join his elder brother, Vallabhdas Jivanlal Sanghvi who had moved there to work at a general store which sold cutlery and kitchen ware. As a young teenager, my grandfather would earn little money babysitting children in Rangoon. Soon the enterprising brothers began buying fountain pens from traders and selling them on the pavements of Rangoon, making tiny profits. Meanwhile the entire family (their mother & sisters) also moved to Rangoon including the new wife my grandfather, at the age of 23 had travelled back to Gujarat to marry. My father was born in 1939 in Rangoon, but then the World war II broke out, In 1941 the family chose to move to Calcutta (now Kolkata) where my grandfather Dwarkadas founded a whole sale trading company called Kiron & Co, named after my father whose name was Kiran (with an A), but when a Bengali sign painter instead spelt it as Kiron (with an O), with no time for corrections, the name stayed as painted. Both the company’s & my father’s. The Brothers soon realized that good business beckoned them back to western India and they moved to Valsad, Gujarat and then to Bombay. In Bombay, Dwarkadas & his brother Vallabhdas invested in and installed a lathe machine in a small shed at Kasturchand Mill compound in Dadar west and began manufacturing most of the Pen parts by themselves. I think Dhiraj Manufacturing was my grand-uncle Vallabhdas’s venture but both companies traded in Wilson as well. In the beginning, the Nibs were imported from USA, under the brand names of Sita & Sity. However, as an error the supplier sent them a box of Nibs called Wilson instead. The war was a huge obstacle to sending the consignment back so they had no choice but to start making the pens with the un-returnable nibs. With the entire pen rebranded as Wilson, the pen sold far better than they expected and yet again another mistaken name was retained. By the mid 1940s the business grew and they had begun manufacturing all pens from scratch. The Manufacturing units moved to Andheri East and to Chakala. And they also introduced other brands such as the President. With almost a 1200 people as staff, there were people from almost all communities working together; A lot of women were hired for the first time. While the machines were worked by men, all the assembling of the pen was done entirely by women. Their daily salary at the time was around Rs. 3 to 4 per day. Meanwhile my grandfather taught himself to read, write and speak in English at the age of 42, because he understood that knowing English was important for modern businesses to grow. Wilson Pens quickly rose to huge fame and became a preferred choice of pens across the country. All government offices, law court, used the Wilson pens. In School too, the teachers would ask us for Wilson Pens as gifts. Chippi chawl was the wholesale office that was visited by salesmen from all over the country who came to negotiate and buy pens and other Wilson stationery. Soon the pens were also being exported to several countries. In 1961-62 a huge union strike set up the family businesses for hard times. The pressures were hard to handle and so the Brothers split their business by picking chits (draw of luck) of the businesses they would run. Vallabdas got President Pens and my grandfather got Wilson along with the Refill plant (an Italian collaboration) that came into my grandfather and his sons share. For some time the businesses ran as smoothly as they could. Both the brothers’ children set up their own units and began manufacturing all kinds of pens. We made Refills, Ball pens, VV pens, Jotters, Jumbos. Several of the new designs were also imitated by new and upcoming businesses. Another violent and strife-full union strike in the early 1980’s organized by the infamous trade union leader Dutta Samant (lasted for approx. ten months) closed down our businesses for a while (including several others’ in Bombay), but it was the last and the third strike in 1998 that broke our businesses completely apart and my grandfather & father had no choice but to shut everything down yet again. So hard was the last fall that my father and grandfather just could not find in themselves the courage to start all over again. Towards the end of his life, Dwarkadas spent most of his time at home. He had since long harboured deep regrets about not being very educated and hence at his voluntary retirement he donated a lot of money for education. He founded and funded almost four to five educational institutions. DJ Sanghvi Engineering College, in Ville Parle (Mumbai), Amrutben Jivanlal College of Commerce (earlier a part of Mithibhai College) also in Mumbai, Jivanlal Anandji High school in Rajula, Gujarat and another school nearby in Amreli District. In 2002, the Pioneer of Pens in India, my grandfather Dwarkadas passed away. Of the several interesting family stories about Wilson, one in particular that makes me most proud is when I learnt that we the Wilson Pen Family, made the orange, thick-nibbed pen that wrote the most fundamental document that defines the state of India: The constitution of India written by Dr. Babasaheb Ambedkar. It was later confirmed via several sources. I am very sure it made my grandfather very very happy and immensely proud too. This is a picture taken in the late 50s by my dad Mr. O S Joseph and each time I look at it, it evokes several fond memories of my childhood. The four-storied building seen behind is Rustom Baug in Byculla, a Parsee colony in Bombay. Every year on first monsoon rains my dad would make me stand by the white pail. “having bath in the first rain cures you of all illnesses” he would say. In retrospect, I now see why that spot was good because all the water from the tiles converged at that spot. I have no memory of this picture being photographed but I will also never forget the Kelkar family. Our next door neighbours. Here Mrs. Kelkar is with her daughter Shalini. I used to call her Aai (mother in Marathi) Aai was more conversant in Marathi than with Hindi and my Marathi wasn’t very good, but we used to get along well. She used to pamper me a lot. I remember the Kelkars had a huge radio in their drawing room (living room) with high ceilings built by the British. But what fascinated me more was the extension speaker, which was in the kitchen. I used to sit on the small stool in the kitchen observing her as she went about happily doing her daily chores of cutting vegetables, cooking, heating the water for husband’s bath and all the while singing a very famous marathi song “Me dolkara, dolkara dolkara dariyacha raja, Vallhav re nakhwa ho vhallav re rama” along with the the radio on India’s only radio network at the time, All India Radio. I remember deciding then, that when I grow up and have my own house I will listen to the radio and have an extension speaker in every room. The best time to be in the Kelkar’s house was during the “festival of lights” Diwali, or rather the month before Diwali because of the lovely aroma of the sweets being made in the kitchen. I had free access to all the sweet boxes and it was one of the reasons why my dad forbade me several time to go there during Diwali. Sharad, Aai’s eldest son was another influential figure during my childhood. The way he would construct the aakash kandil (paper lantern) was nothing short of perfection. He was very forthright & responsible and even though I could not understand much Marathi at the time, I could make out that he was someone who had some principles and was fair in all dealings. Today, I don’t have an extension speaker but a radio sits in my bed-room and is almost always on for 24 hours. There is nothing better than listening to the good old songs. My Grandfather, Bhalchandra Ambadas Haldipur. 1975. Bombay, Maharashtra. His name was Bhalchandra Ambadas Haldipur. He was my grandfather and we fondly called him ‘Daddy’. In this photograph he was being awarded the President’s Police & Fire Service Medal, highest achievement award for a police officer in that year. Bhalchandra Ambadas Haldipur or Daddy was the only person I have ever been scared of. And that fear came from the immense respect I had for him and for the school of discipline he belonged to. I was all of 10 years old when Daddy passed away in 1992. But he left behind a few things which were to influence me for the rest of my life. Deep-rooted values and beliefs, a memory of his charming personality and the aura he impressed everyone one with, be it family or friends, his tongue-in-cheek humour in the most difficult times, and his last words to me. My grandfather, Bhalchandra Ambadas Haldipur joined the Bombay City Police in 1939 as Sub-inspector , Thoroughly “clean” and incorruptible, he was known for his tireless and thorough investigations, and fearless drive against crime during his hectic career spanning 36 years in the Police Force. Whether working in the Crime Branch or Anti-Corruption Bureau (ACB), he remained a courageous, fearless crime-fighter who led his men from the front. My grandmother has always had interesting tales to tell us about the way he worked and one of my favourite anecdotes is the the story of him Capturing two conspirators of Mahatma Gandhi’s assasination– Narayan Apte and Vishnu Karkare in 1948. What set him apart in his investigation procedures was a set of sketches he drew during his chase and trial of the killers. Daddy was also so much more than a great police officer. He was a body builder and a Pole Vault Gold medalist at the National Olympics in 1940. A multi-linguist, he had passed three examinations in Urdu while in service. He also initiated the Annual Ganesh Chathurthi festival at Santacruz Police Station in Bombay. After he retired in 1975 as the Deputy Commissioner of the Anti-Corruption Bureau (ACB) he was one of the founder members of the Senior Citizens’ Club of Bombay. He was a music and instrument buff, a loving husband, father and grandfather. If I had a time machine, I would have had only one wish – more time with Daddy but I’m also glad that I have no such privilege because he would have only been disheartened to live and watch the country today, rotting with corruption and indiscipline. I have been wanting to share my grandfather’s story for a long time now. He always makes my heart swell with pride and brings the widest smile. He is the hero, my Idol. We lived in Shivaji Park, Bombay in a house that our families had lived in for eight generations. My father‘s name was Tulsiram Pawar and my mother’s was Chandra Bai. My grand-mother who lived until the age of 101, used to work in the municipality as a road sweeper. My father also worked for the municipality of Shivaji Park, cleaning garbage. But he was an alcoholic, most of the times drunk and incapable of working. He would beat up my mother and abuse her all the time, but she gulped all the pain and began working instead of him. She is the one who earned and brought us all up. Her salary at the time was only Rs. 200 a month, so it was tough on her. Most men in the chawl were in similar jobs and were all drunks & wife beaters, exactly like my father. 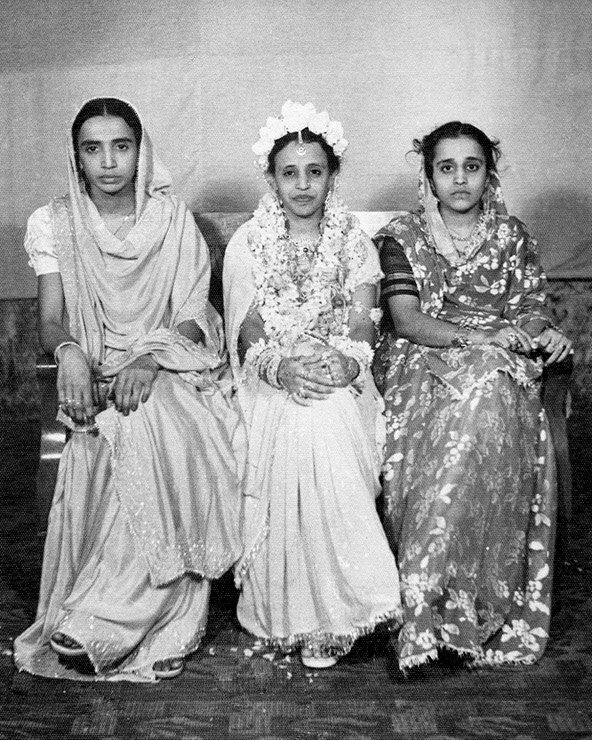 All the girls in the chawl were scared to get married anticipating the same future. 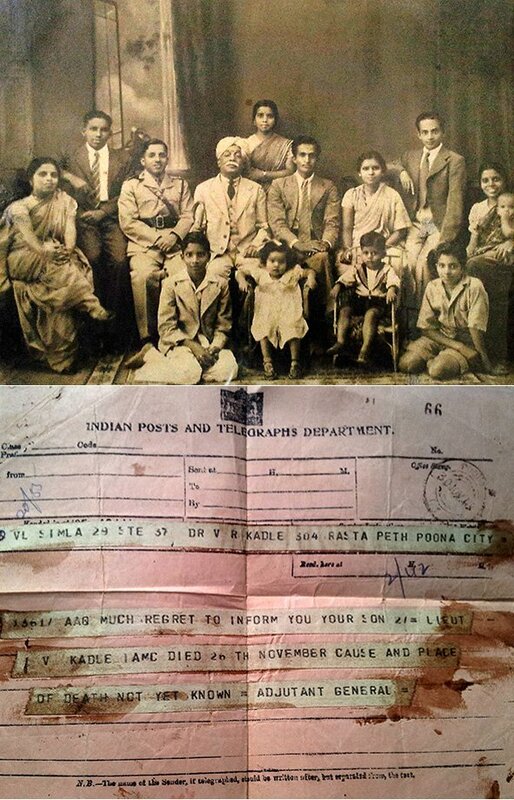 My family belonged to the Mahar Caste, considered untouchables and of low caste in India. But we all got saved when my parents adopted the beliefs preached by Babasaheb, Dr. B.R. Ambedkar. If it wasn’t for him, we would have been on the streets or dead, of hunger or indignity. My parents converted to Buddhism following Ambedkar’s encourgement and since then we have been restored our dignity. We are four sisters and two brothers. I was born on November 13, 1963. In school I studied up to class 10 (sometimes as night classes). I used to love dancing, participated in school events and played everyone’s favourite sport at the time Kho Kho. Embroidery was another skill I learnt from the women in the Chawl. On Saturdays & Sundays we would finish the house-work faster so we could rush to watch Marathi movies in a quarter that had a B&W television. In 1982, when I was 18 my parents got me married. The chosen husband was Vishnu Rama Kapse. He was 15 years older to me. When our parents asked us to marry, we just did, there was no argument or discussion over it. My mother said that they were a well to do family, and they eat a lot, and so I will be happy. Later I heard, that my husband too didn’t want to really get married, but others advised him that he needed a partner who could also contribute to earnings. The wedding was all paid-for by my mother. I think she must have spent Rs. 5000 on it. As was tradition for the In-Laws to do, my actual name Satyabhama was changed to Smita by my husband, but my mother-in-law couldn’t pronounce it so she began calling me Sunita, and now everyone calls me Sunita. 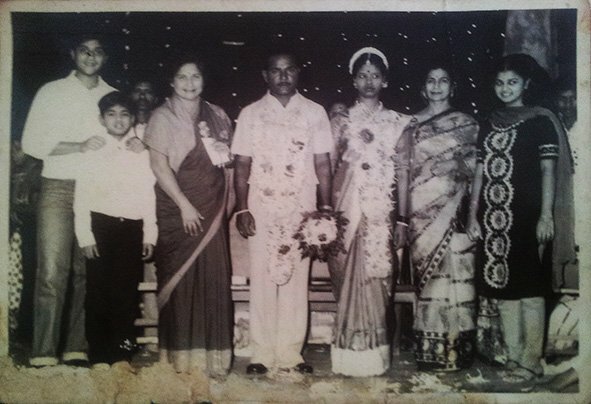 This photograph is from my wedding reception in a small hall in Bandra, Bombay. With us is my husband’s regular employer (since he was a child), Mrs. Ula and her family. They really loved us. Now they live in USA. I am wearing a Blue saree and my husband wore a Grey suit. In Buddhism, during the actual ceremony we wear white, not red as is the norm of most Indian weddings. With our dharma guru as witness, we exchange garlands, listened to a short sermon and that was it, we were married. There were around 200 guests for our wedding. The gifts we received were currency notes of Rs. 2 or 5 in small packets. I got married into a very large family, with mother, sister, brother and cousin in laws. My husband was a simple decent looking man. He respected, and loved me passionately. He never hit me or embarrassed me in-front of anyone. He used to say “If I disrespect you in-front of someone else, they won’t respect you”. That is the reason my children respect me too, because that is what they saw. My husband really loved me, showered me with attention, but I am aware that he was also afraid that I might leave him, because I was a good looking and to top it, 15 years younger. That is the reason he never wanted to live away from the large family because he felt it kept me in check. I always found it very amusing but in a way it imparted a lot of self-confidence. We were great partners & friends and would never do anything without consulting each other. My husband would keep me updated on current affairs of the world. When I couldn’t understand, he would explain everything patiently. My husband’s family came from Ratangiri and his family owned a lot of agricultural land there. But once the Dam and new railway tracks began to be constructed, many new people came and grabbed most of our land and so many of us, also from near by villages, were left with almost nothing. We still have a legal case going on but I doubt anything will happen. Like thousands of others, my husband at the time in the 1980s was working in the Textile Mill, breaking yarn. When the mill shut down (called the Great Bombay Textile Strike), he began working as a wall painter, or as daily labour (also for the family in the picture). The same year my eldest daughter Annapurana was born, but the earning was not enough for us, so I began working as a domestic maid. My first monthly salary was Rs. 75 with a Sitan Family here in Bandra, I have now worked for them for 32 years and I still work there. Then we had a second child Abhijeet, a son and a third another daughter, Priyanka. My husband and I worked very hard and educated all three of my kids. They went to government municipality schools, and then they went to college. Fortunately for us they are now married into good families. I never chose to be a maid, but I did it because if I didn’t work we couldn’t earn. And with my experience, being a good and honest maid was the best I could do. My husband would not give me all the money he earned, because some of it was kept for his brothers and their families whom he supported largely. So I too saved, keeping money aside and buying gold as an investment without him knowing, but the amusing part was he knew all along. I always worked around the Bandra, as it was close to home. The Parsi family next to our home sold their land and in its place a mosque was built. But we all casts and religions lived along as good neighbors cordially, perhaps because we were Buddhists and non-violent. In-fact in times of conflict in Bombay, the muslims neighbours always came around to check if we are okay. My normal routine everyday for years was getting up at 6 am, pack my husband’s and kids lunch tiffin, go do all my work and return by 2 pm to fill water that would only come in taps twice a day. I learned a lot by working as a maid, like cooking different Indian Cuisines from my employers and then I would try it all at home. My family loved my cooking. Even when my daughter got married, I had every feast cooked at home. I have been lucky that all my employers respected and taught me a lot. Looking at our employers helped us aspire for a better lifestyle. But one thing that makes me sad is how people spend on things much more than they need to. Wasting food is probably the biggest problem I see in so many households, the wealthier the families the more food is wasted. But people and women are also more independent and that is admirable, though I still get worried if my daughter doesn’t come home on time. In 2006, my husband developed a heart problem and he began to keep unwell often. So I got a couple of more jobs and continued working as a maid cooking, cleaning, sweeping, and washing to earn enough to pay for his medical bills. Many employers too helped with the medical bills. But in 2012 his health worsened and he passed away. I now continue to work as a maid, because if I didn’t work I would go crazy. Because of my children, I am not struggling for money, but it is good for me, it makes me independent, I work in places I like to work, I am respected and I get to step out. But I really miss my husband a lot. He was my friend, my protector, my partner of life. I really feel alone and cry when I think of him, but I thank Buddha and Sai baba because of whom I have great children, siblings and their families. 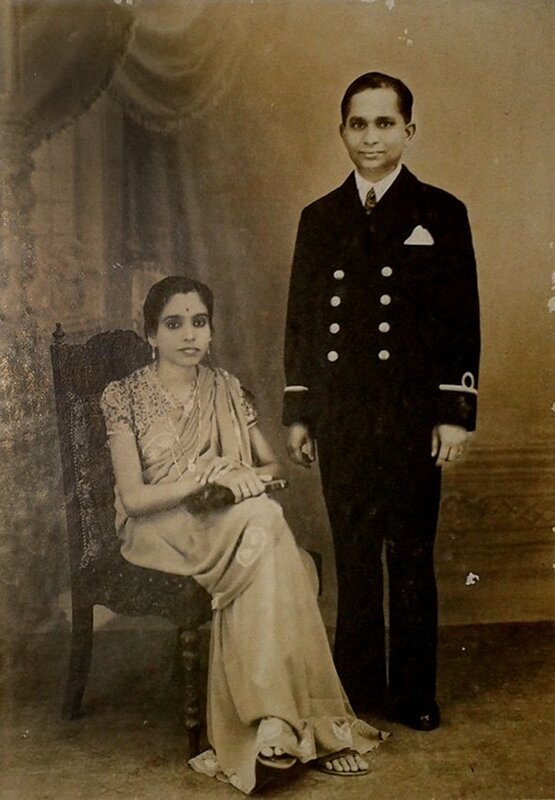 This photograph of my parents K. M. Devaki Amma & Lt. Cdr. P.P.K. 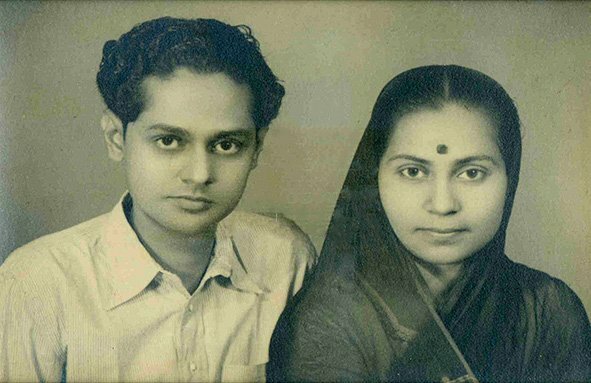 Menon was taken at a Photo Studio in Bombay in 1941, soon after they were married. My father was based in the city serving the Naval Force. My mother, K. M. Devaki Amma belonged to Feroke, a part of Kozhikode in Kerala. Her initials K. M. stood for Kalpalli Mundangad and her family originally belonged to the Anakara Vadkath lineage. 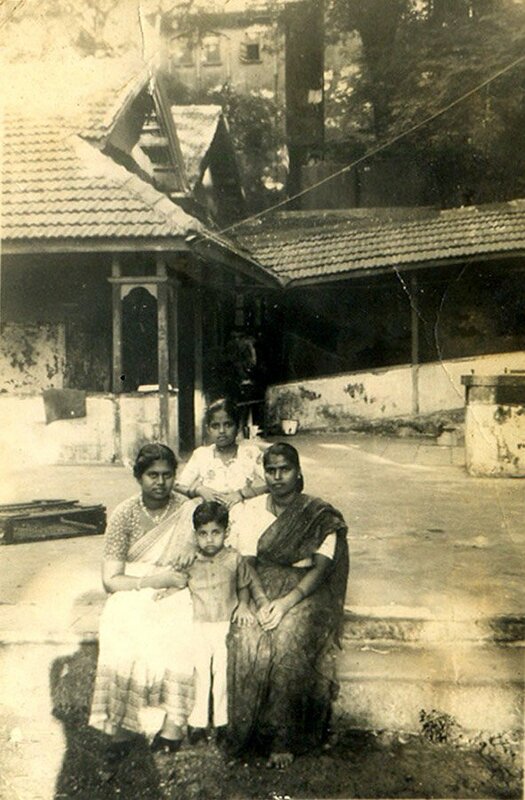 The large joint family of more than 25-30 people lived in a house called Puthiyaveedu which still exists in Feroke, however the members are now settled in far flung places and my grand aunts and uncles are no more. My mother had to give up school very early in life. She came from a large family of 14 brothers and sisters and belonged to an era where a girl’s formal education wasn’t a priority. While they grew up under the tutelage of grand uncles and aunts, they learned to cook, clean, and learnt to make do with and share whatever little they had with their siblings without ever complaining. Congee (Rice Gruel) was what they mostly had for lunch and dinner, supplemented with a little coconut chutney, and may be a side dish of some green banana, but only if they were bestowed with a ripe bunch of plantains available from the kitchen garden. My mother and her sisters’ daily life entailed preparing food for all members of their very large family. By the light of a wick lamp, sweating by the blaze of crackling coconut fronds they would wash dishes with ash from the kitchen hearth and rinse them with water drawn from the well. My mother in personality was very self-reliant and was happy with whatever little she had. Arranged by my paternal grandmother, when Amma married my father, a man with an aristocratic lineage and a Naval officer, my father’s cousins would scoff at her and condescendingly regard her as a ‘village girl’. They had been educated in Queen Mary’s Women’s college, Madras (now Chennai) whereas my mother had studied only up to Class IV in a local village school in Karrinkallai. Undeterred, my father, who knew his wife was a bright and intelligent woman took her under his wing and brought out the best in her. He taught her English and bought her abridged versions of books written by Charles Dickens, Walter Scott and many other great authors. He read out passages to her and patiently explained to her what they each meant. Thus Devaki, my mother, slowly emerged from her rural background, and became a lady endowed with great poise and charm. Not only did she steal my father’s heart, but even of those who befriended her. She became a much sought after friend by wives of both British and Indian naval officers. She taught them to cook Malayali dishes and stitch & embroider; skills, which were executed by her exquisitely. She wrote and spoke English with such assurance that she could put a present day Post Graduate in English to shame. But despite all these changes, she remained loyal to her roots, proud of her humble origins, and very attached to her siblings. Sometimes, deep into the night I would catch whispers of my parents’ conversation as they sat and planned the monthly budget, and spoke about their dreams of providing us with the best of every thing. It was my mother who insisted that my sister and I be given the best education they could afford. She firmly refused a State Board SSC education, and insisted on us being admitted into schools which followed a Senior Cambridge syllabus. She was efficient and fiercely independent. By comparison I was a pale shadow. In fact, many times I used to feel very unsure of my self in her presence, intimidated by her indomitable spirit and the complete control she had over any situation. When my father was suffering Cancer, she stood by him; nourishing him with love and healthy food, while my sister and I watched our father’s condition worsen by the day, helpless and often giving in to tears. My mother always remained calm, but only when he breathed his last in 1977 did she break down completely. He was her life force, and she was his guiding light. Theirs was an extraordinary relationship, always supportive of each other at all times and completely committed to each other till the end. After I graduated, it was her dream that I put my education to good use. However, a few years after marriage when I was forced to give up my teaching post, she never forgave me till she breathed her last. To make up for it, I began to write and put together a collection of short stories, but the book never got published. What pained me most was that I was not able to place a copy of my book in my mother’s hands and make my peace with her before she passed away in 2008.